When it comes to social media marketing are you still struggling with a social media marketing strategy? Is it getting hard for you control the conversations about your company, your products or your services? See it as a two-way street. As a brand, if you try to only promote your product or services then it isn’t a place for you. Use it as a tool to communicate and relate. To understand consumers’ perspective on this social media communication, JD Powers and Associates along with NetBase surveyed US consumers in December 2012. Do you want companies to listen to what you say about them online? Do you want companies to respond to you when you talk about them online? And statistics shows that almost 50% of consumers want businesses to listen to them to improve their products while 60% of consumers want businesses to respond to their complaints. Many marketers launch their social media campaigns because others are doing this and so they need to. But when it comes to understand how they will make these channels work for them and how they will be managed. Most of them start this with no goal in mind and even worse, with no understanding of how social media marketing works. Many believe that social media is a customer acquisition gateway and short-sided in defining realistic results. Unfortunately this boils down to loss of valuable time, losing customers, losing market share, and low profitability. Stop chasing your tail in social. 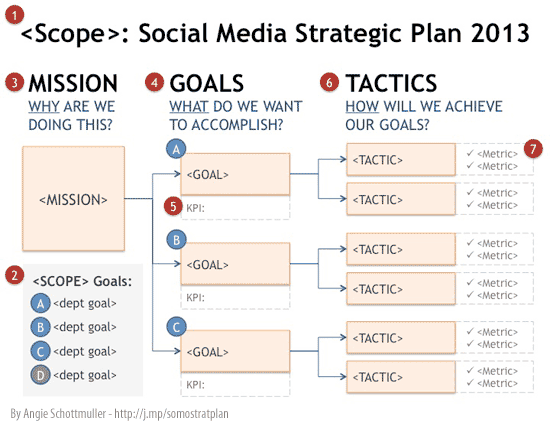 As Angie Schottmuller describes mapping a Social Media Strategic Plan by using a “Who > Why > What > How” model to build a cascading tree for “Scope > Mission > Goals > Tactics”. Here are 6 easy to follow steps to start your Social Media Marketing strategy right away. But as marketers, we all know that it is engagement that matters. But, what sort of engagement can be taken into account? Positive engagement? Number of comments on a controversial piece of content? You need to take a step back to define specific, actionable, and (most importantly) reasonable SMM goals. You can apply the SMART Methodology (Specific, Measurable, Actionable, Realistic, and Timed) to social media objectives. As an example for a campaign you can set a goal “increase brand awareness by 10% in the next six months”. Develop buzz and interest around a new product. Generate relevant and targeted traffic to your site. Increase website visitor loyalty coming from social media. Increase conversion rate from social media. 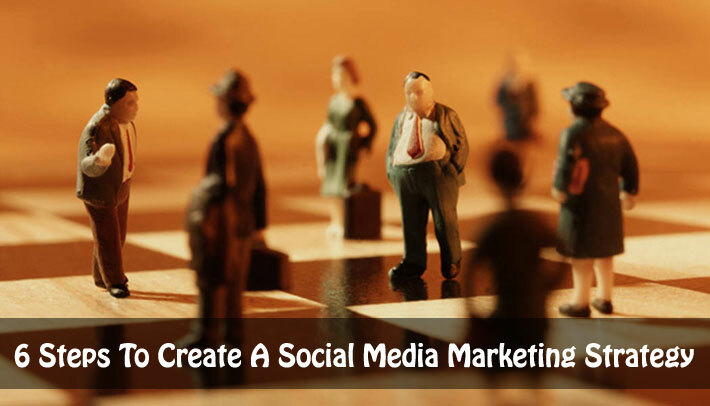 It is very important to figure out exactly who you want to reach in order to develop a solid SMM plan of action. Be as specific as possible. Consider industry, gender, age, purchase habits, income level, education level, etc. For each type of audience, break down and dig deeper with – age, income, location, and reasons for possibly buying your products/services. Social Media gives brands to develop their own voice & attract customers to their brand. It’s about building real relationship with you audience – more specifically what people can relate to. Start with creating & implementing your “Brand Voice” that goes with your specific target audience. But how you can develop your own brand voice? As Courtney Seiter recommends to explore the three Cs – culture, community and conversation. Now the hardest part of your social media marketing plan is to find, create, and delivering engaging content. Social media execution may seem hard to deal with, but with a proper strategy it is doable and can drive real (marketing) results. How frequently you will post across social media channels? To create and find content that your fans and followers will find engaging that aren’t about selling always. Try these tactics instead. Set a 90-day Plan: Now to start your social media campaigns you might want to be across all social channels, but in order to remain consistent, you must start small. Let’s say you’ve decided to use Pinterest and SlideShare. Now set a 90-day plan to build your social media community on these channels and start engaging your target audience with consistent and compelling content. Also a traditional offline marketing push with help you get started. Develop an Editorial Calendar: Okay so you’ve set your 90-day social media plan. Now it’s time to get specific on what you’ll do in that 90-day plan. Find a target-area for each month and determine what type of content you’ll post and frequency of your content. Build a Maintenance Schedule: This is where we get to the nitty-gritty. Create a maintenance calendar of daily, weekly, monthly, and as-needed tasks. Consider things like monitoring the accounts and responding to the audience, continuing to build the audience, and writing the content for the day, week or month. Assign Responsibilities: If you’re like many business owners, you might want to do it all by yourself. But it’s always a good practice to assign a specific person to each task – even if it is you. Also calculate how much time it’s required to complete each talk, so that you can schedule your time appropriately. Evaluate: After the 90 days are over, review your progress. Have you met the goals you have planned? Did you reach your targeted audience? What worked for you and what didn’t? Do you need to shift your focus or continue with what you’ve done? Is there any other form of media you want to include in your plan? Be honest with yourself while you are answering these questions and adjust your social media plan accordingly. You can download this Social Media Marketing Strategy Workbook to give it a kick start. 10 Social Media Campaigns that Failed! Avoid their mistakes! Social media marketing can be a tool to create online brand awareness, customer engagement, and audience growth. This requires a focused, measurable plan and a commitment to deliver consistent and engaging content. In addition, it’s really crucial for you to have a clear understanding of why social can be useful for reaching your business goals. Great inforgraphic! Loved it, thanks for sharing. Great infographics! If we spend the time to dedicate to our success through social media marketing, we will find all-new ways to achieve growth for our business that we never even knew existed before. Social Media Marketing is a big help for our personal brand, influence and ability to find and convert prospects from anywhere, anytime! Thank you so much Steve for your valuable inputs. I really appreciate that. Glad you liked this post. Great Infographic, it is surely going to help marketers launch successful social media campaigns! This is an extremely well written post on how to get even better at social media. If we could learn something new everyday about social media, success would grow by the minute. I’m going to have to take my time, and take some notes on what you have written. Creating a social media strategy doesn’t seem to be an easy task. Campaigns or contest we choose should be able to drive the required traffic on the social media profiles. How many likes will be driven or how many people will visit the page is very important. Which is why it is vital to build target oriented strategy which will help us to create content which is appealing for that particular group. Hey Priyanka, thanks for your insightful comment! I totally agree with you that Social Media Contest should be able to drive the required traffic. Along with it, it should meet the goals for that specific campaign, Not just generating likes but also increase engagement, create buzz, conversion etc. I absolutely agree with you that a campaign should be laser focused to the target audience to bring the ultimate outcome. Saha infographic is great i loved it…can you please suggest me the tool you used to creat it….thanks in advance…..have a great time….